Otherwise, thanks so much for sticking around! I really appreciate you all very much. I have a pretty manicure for you today, featuring that good ol' fishtail pattern. I have a tutorial here if you want to learn how to do it for yourself! (: I really like this colour combination and this might sound weird, but I'm really pleased with my actual polish application haha. Started off with China Glaze Kinetic Candy. The gradient is Sally Hansen Gilty Pleasure, a gold glitter by Love & Beauty and Sephora by OPI Only Gold For Me. I used a white striping polish and Sally Hansen Gilty Pleasure for the fishtail. That's all folks! 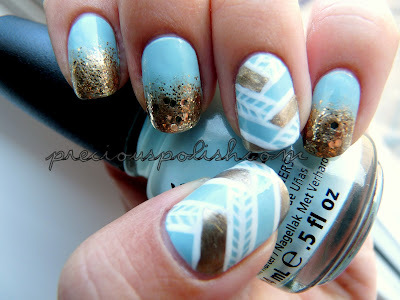 Look out for some cool tribal manicures up next! Eek long commute :( I hope things get better. Your mani looks gorgeous as ever! It's awesome! I have never seen gold one nail polish but would love to try the same for my fingers. Thank you, Jay! Definitely try it out!